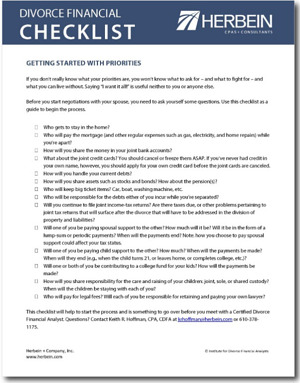 When beginning the divorce process, you may not know what your priorities are. This checklist reviews some of the common discussions that come up when beginning this process. Because of the financial complexity of many divorces, more and more financial professionals are being asked to play an active role helping individuals and lawyers sort through the financial issues related to divorce. A Certified Divorce Financial Analyst (CDFA) is someone who comes from a financial planning, accounting, or legal background and goes through an intensive training program to become skilled at analyzing and providing expertise on the financial issues of divorce. After filling out the form to your right, you'll be able to instantly access the checklist.